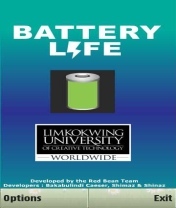 Summary: Battery Life is a small widget for Symbian s60 5th edition phones that provides accurate info about the battery status. 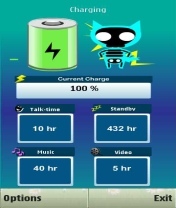 Battery Life is a widget that provides you with the most detailed and accurate information about the battery status of your handset as well as the amount of time you have remaining to use your phone, watch videos, browse the web, or listen to your favorite music. this app sux... i thought i'd get more details about my battery level... the other day my battery worn up like 30 minutes after seeing i still had 15% , and i wasn't even online. I mean its grat knowing i have like 40 hours of music, but when the lowest level i've seen is 15 % when i'm sure it's lower. hey, it does not support for my N97 mini.. pls help? best application to view your batter status. thank you. why it needs to access the net and read the user data? If i answr wz no, it doesnt work!! I think this software is a most have. Kudos! In Nokia 5230 it show worang Indecate Battery lival. it's simply d best,if u doubt me try it urself. Downloading steps are to be minimised. when i try to download,it said" You don't have permission to access/mirror/Battery life.wgz on this server.what should i do, pls help. It sounds cool thanks Hope it works!!! To begin with, I would like to thanks in the staller as well as informative access. I will have to acknowledge which often, We have not heard concerning this information. We now have observed quite a few new information with regard to cause. Many thanks a lot for providing this effective as well as interesting information. We're waiting around pertaining to other thrilling posts due to you from the nearest long term.